Evidence on Cloud from Intrensic gives agencies freedom to store, share, and retrieve all of their digital evidence online with truly, unlimited storage. Next generation body worn cameras with the highest capture video technology from the world’s leader in wearable video technology, GoPro. Upload video evidence securely and quickly no matter where you are so you can get back to doing what you do best. Protecting your local community. The demands of today’s Law Enforcement Agencies require a camera that works just as hard as you do. 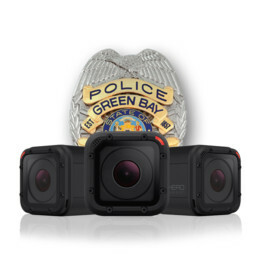 That’s why we’ve partnered with GoPro® to bring Law Enforcement Officers a body worn solution that can capture the evidence you need reliably no matter what the day brings. From the moment evidence is captured, Intrensic goes to great lengths to ensure both the security and integrity of your data whether it’s stored in the cloud or on-site servers. We work with your policies and budget to provide a solution that is right for your agency. Intrensic's Software makes it easy to manage all of your agencies digital evidence including videos, photos and documents in one place. When we created the Intrensic DEMS platform, we sought the input from agencies across the country so tasks like sharing cases, managing retention schedules, and administering user permissions are simple and intuitive. After evaluating several body cameras and digital evidence storage providers, I have not seen any end to end digital evidence management system as robust and durable as Intrensic. From the hardware and software to the support, Intrensic’s digital evidence solution provides all the tools needed to successfully deploy a body worn camera program for agencies of all sizes.